Debt can be stressful for anyone, it doesn’t matter who nor how much the debt is. Debt is debt that is all there is to it. Some people let debt run their lives. Others get control of it and do all it takes to make it disappear. My latest guest is a true inspiration (and it’s not because we share the same first name **wink, wink**). Jennifer Dent is a Integrative Nutrition Health Coach who not too long ago was in a dark place where she wasn’t able to make her minimum payments on her credit cards nor pay her rent. She also was in a significant amount of debt….6 figures worth! 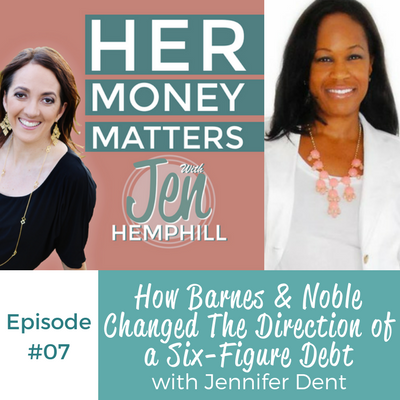 In this latest episode she will share with you how five years ago Barnes & Noble changed not only the direction of her debt but her life and so much more. I’d love to hear from you, what is a personal finance book that you have read and loved?